I received a phone call this morining from Paul Schrade. Many of you know he was the Kennedy supporter on stage with Kennedy when Bobby gave his victory speech. 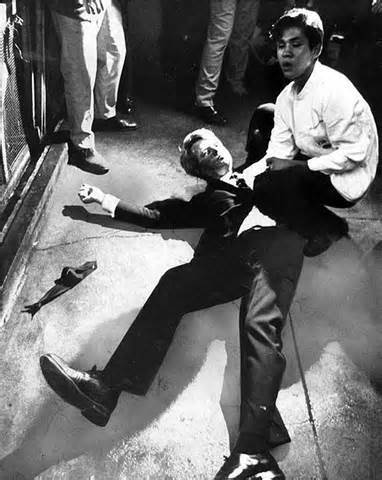 Paul followed RFK into the pantry and standing behind Bob, was shot in the head, falling unconscious to the floor. I interviewed him some time ago. He wanted to give me an update on the case and find out how along I was in writing my book on the RFK murder. I told him I thought I could identify the second gunman but needed a little more time. Paul told me that because of the Phillip Van Pragg-Robert Jolling tape of gunfire in the pantry, Gibson, Dunn & Crutcher, a major LA law firm, has taken on the case that he, (Paul) et, al is undertaking. Paul is not happy with whomever actually shot him. Also, Steve Cooly, District Attorney for Los Angeles, has expressed openess to any new evidence in the RFK case. Wow. I told Paul that i had read a Brief of an earlier case that he was a part of in the 70s and he said that Allard Lowenstein and Vince Bugliosi worked on that one. Turning to Sirhan I expressed fear for Sirhan's life at the new prison. Paul told me that no one has been allowed to visit Sirhan since his transfer, not even his brother, Munir. Munir was told that Sirhan was in "Orientation" and until that was completed no one could have access to him. I think we all know what "Orientation" really means. Somewhere on those grounds is a building where Sirhan is being given a tuneup- mkultra style. Dr.Pepper may have been getting to close to breaking Sirhan's mind and reaching through to the other side. Thanks for the update Michael. I think you are correct in your assumption about what might be taking place with Sirhan. Bastards! I think they will try to kill his mind first, and if that doesn't work...try the Jeffery Dahmer approach to silence him forever. Anyway, it sounds like things other than that are moving in a positive direction. Good luck with everything and keep us updated. If I can help in any way, let me know. I hope sirhan lives long enough to see justice done. they are in control and made sure ruby, james earl ray and sirhan hane remained silent. the minute it looks like they are gonna crack, its a heart attack, cancer or some other disease from their bag of tricks. it is always possible that the jfk assassination could be solved by coming in the back door i.e. solving the rfk murder and working backwards. we all know that the same basic cast of characters are involved in both. Great news Michael. Looking forward to hearing how it goes. Photographer Evan Freed, one of the polka-dotted dress girl witnesses, swore out an affidavit in 1992 that he had seen a gunman, not Sirhan, shoot RFK from behind (Sirhan was by virtually all accounts in front of RFK and not closer than a few feet away). No doubt the current incarnation of Dr. Mendoza is troweling on some Amnesite-brand cerebral patch. But as long as Sirhan is alive, he holds the answer to who programmed him. Freed's detailed deposition in 1992 makes him a danger to the killers. When was the last complete physical for Sirhan, one with all the blood and image screenings. One expects an evil prick, be it shiv or syringe. Truth being hated by evil. Here is someone we should definitely contact...Governor Arnold Schwarzenegger. Arnold is married to RFK's niece after all. Please write or call this number to allow visitors (like Sirhan's brother and Mr. Pepper) AND to voice our concerns about this transfer from Sirhan's last facility, where Sirhan was in a much safer environment. Don't let them transfer you to the prison system...the buck stops at Arnold. you can gleam additional perspective here. When I talk to people who aren't really in the know about either the JFK and RFK assassinations, most lean that the JFK assassination was most likely a conspiracy, based on what little that they have studied it. It makes me feel a little better knowing that all the disinformation which has been put out over the past decade or so by people like Vince Bugliosi and Bill O'Reilly, not to mention the bogus Lone Nut theory television programs put out on the History Channel and on Discovery, have not really made a dent in changing the perception of the general populace. That takes me to the RFK assassination (which ironically Bugliosi said was a conspiracy which reached the highest level of government). Most people I talk to believe that Sirhan was the real killer. Very few know about Thane Cesar and his involvement in the RFK murder. Even less know about Michael Calder's contention that there were actually two "Sirhans" on the scene and that the "other" Sirhan was the one who actually killed RFK. The same holds true about what Dr. Thomas Naguchi, the L.A. coroner said in terms of where the wounds were. Naguchi said that all three wounds to RFK, including the fatal head shot came from behind and to the right of the Senator. The fatal head wound was fired from a distance of 1-3 inches away from Kennedy's head. Sirhan never got closer than 3-6 feet away from RFK and was also always in front of Kennedy. Very few people know this. At least in a general sense. Back to Cesar. At first I believed he was the real killer of RFK. But based on Evan Freed's Affidavit, I believe Cesar was there to help the true assassin get close to RFK. So close, that Cesar had his clip-on tie pulled off by RFK during the shooting. You can see Cesar's tie in this photo, lying next to the mortally wounded Bobby Kennedy. Hope we don't see another George de Mohrenschildt ending !!! Right now as much light needs to be put on Sirhan Sirhan as can be put...Let them know we are watching !! !